The annual Papua New Guinea-Australia 25th Ministerial Forum (MINFOR) is underway in Madang Resort Hotel. The Forum is an important bilateral meeting between the two countries. Australia and PNG have a strong and dynamic relationship based on close historical, economic and geographic ties. Two-way trade between our countries is worth $6.8 billion (K16.63 billion) and Australian investment in PNG totals $19 billion (K46.46 billion). The Forum provides an avenue for on-going dialogue on current or emerging bilateral issue of mutual interests and also to maintain a strong and strategic partnership. 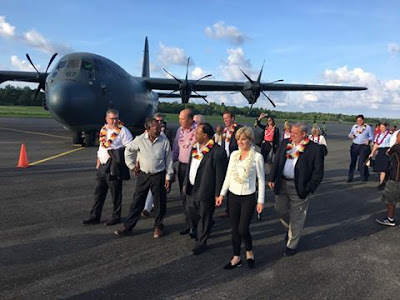 The PNG delegation led by the Minister for Foreign Affairs and Immigration Rimbink Pato , accompanied by the Australian delegation led by the Foreign Minister Julie Bishop and her delegation flew to Madang on an Australian Airforce plane. Meantime, the 24th MINFOR was held at Parliament House in Canberra on March 3, 2016. At last year’s meet, the Ministers' discussions reflected the maturity of our relations and the comprehensive strategic and economic partnership shared by Australia and PNG. Ministers agreed to continue the close partnership on security and strategic issues, trade and investment, strengthening regionalism in the Pacific and signed a new Aid Partnership. Ministers emphasised the importance of building people-to-people ties, raising awareness among young people of Australia and PNG’s shared history and streamlining travel arrangements.